Sporting mostly the same premise as Monster Squad, this Hanna Barbera cartoon lasted a couple of seasons on CBS Saturday mornings. 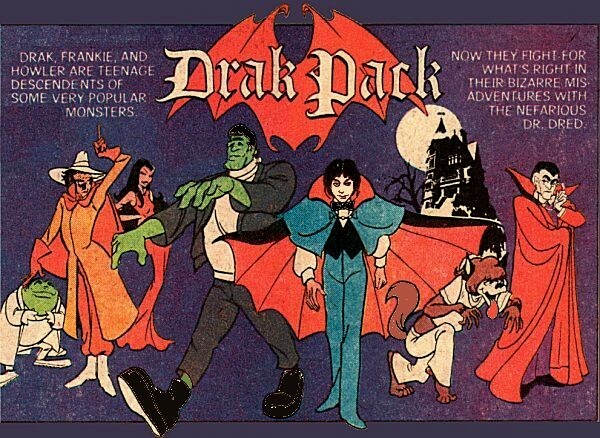 Drak, Frankie, and Howler are all descendants of classic monsters and are "dedicated to reversing the evil image of their forefathers" by becoming superheroes. Unlike the Monster Squad characters though, these three have secret identities as high school students. When trouble appears - usually in the form of the supervillain group, O.G.R.E. - the trio gives each other the Drak Whack and transforms into monster form. They have a flying, amphibious car and superpowers. Drak's a telekinetic shape-changer, Frankie's super strong with electrical powers, and Howler has a sonic howl and super breath. The group also receives direction from Drak's great-uncle, Dracula himself (whom they call "Big D"). O.G.R.E. (Organization for Generally Rotten Enterprises) is made up of Doctor Dred, Toad, Fly, Mummyman (who controls his bandages and uses them as weapons), and Vampira (another shape shifter). Methinks that intro video was a bit indulgent on exposition. I remember this more for the add in comic books than the actual cartoon. I was SO into this show as a kid. I know it didn't last, but to me it was like the greatest thing, for a brief time. Loved it, loved the whole Saturday morning thing at that time. So awesome.